Moringa oleifera is the most widely cultivated species of the genus Moringa, which is the only genus in the family Moringaceae. English common names include: moringa drumstick tree (from the appearance of the long, slender, triangular seed-pods), horseradish tree (from the taste of the roots, which resembles horseradish), ben oil tree or benzoil tree (from the oil which is derived from the seeds). It is a fast-growing, drought-resistant tree, native to the southern foothills of the Himalayas in northwestern India, and widely cultivated in tropical and sub-tropical areas where its young seed pods and leaves are used as a vegetable. Moringa oleifera is a fast growing, evergreen, deciduous tree. It can reach a height of 10–12 m and the trunk can reach a diameter of 45 cm. The bark has a whitish-grey colour and is surrounded by thick cork. Young shoots have purplish or greenish-white hairy bark. The tree has an open crown of drooping, fragile branches and the leaves build up a feathery foliage of tripinnate leaves. The flowers are fragrant and bisexual, surrounded by five unequal thinly veined yellowish-white petals. The flowers are approximately 1-1.5 cm long and 2 cm broad. They grow on slender hairy stalks in spreading or drooping later flower clusters which have a longitude of 10–25 cm. Flowering begins within the first six months after planting. In seasonally cool regions, flowering will only occur once a year between April and June. In more constant seasonal temperature and with constant rainfall, flowering can happen twice or even all year-round. The fruit is a hanging, three-sided brown capsule of 20–45 cm size which holds dark brown, globular seeds with a diameter of approximately 1 cm. The seeds have three whitish papery wings and are dispersed by wind and water. 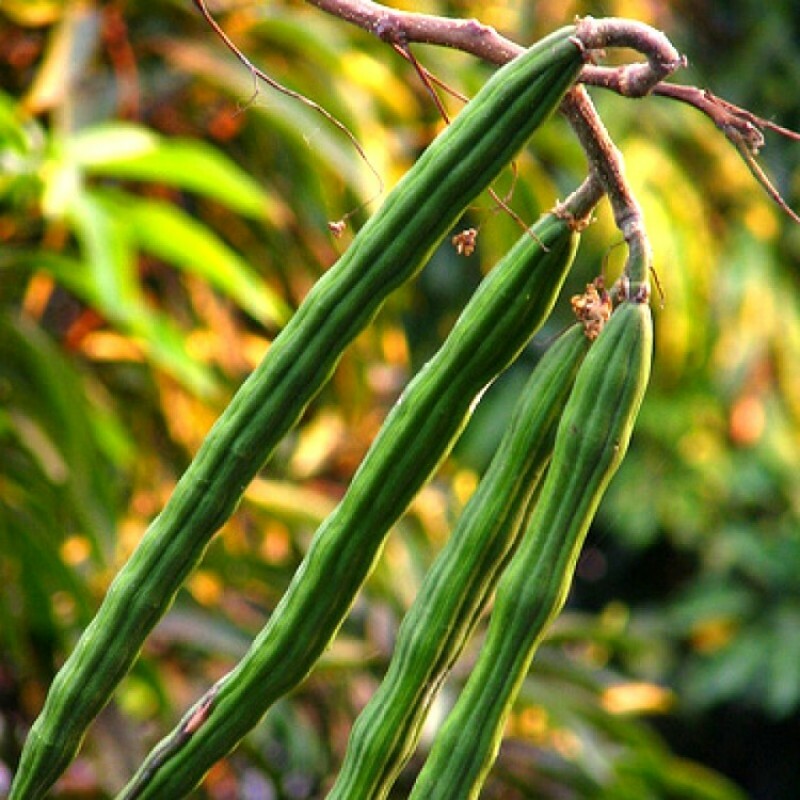 In cultivation, it is often cut back annually to 1–2 meters and allowed to regrow so the pods and leaves remain within arm's reach. When the plant is grown up from cuttings the first harvest can already take place after 6-8 month after plantation. Often, the fruits are not yielded in the first year and the yield is generally low during the first years. By year 2 it produces around 300 pods, by year 3 around 400-500. A good tree can yield 1000 or more pods. In India a hectare can produce 31 tons of pods per year. Under North Indian conditions the fruits ripen during the summer. Sometimes, particularly in South India, flowers and fruits appear twice a year and so there are 2 harvests, in July to September and March to April. Average yields of 6 tons/ha/year in fresh matter are can be achieved. The harvest differs strongly between the rainy and dry season with 1120 kg/ha per harvest and 690 kg/ha per harvest. The leaves and stems can be harvested from the young plants 60 days after seeding and then another 7 times in the year. At every harvest the plants are cut back to within 60 cm of the ground. In some production systems the leaves are harvested every 2 weeks. Foidl. et al. (2001) showed that the cultivation of Moringa oleifera can also be done intensively with irrigation and fertilization with suitable varieties. Trials in Nicaragua with 1 million plant/ha and 9 cuttings/year over 4 years gave an average fresh matter production of 580 metric tons per ha/year equivalent to about 174 metric tons of fresh leaves.